Probably difficult to answer, but I have a curious issue. On a route (Val-de-Travers) I use timetable mode. However, on two sections (Travers-Butte) of the route I always have an emergency stop when I ride one of the trains (Player train) at >40km/h (overspeed) on the main line. OK, clearly, somewhere must be a combination in the route that causes this. However, in F5-Hud and F4 I see nicely the "mainline speed" of 80-90km/h, also the message "allow speed to ..." one gets. Further there are no obstacles, such as yellow signal or deflecting point (40km/h limitation). It is even stranger when use the same train/route/path in Explorer mode, or even better, if I use the Player train in manual mode (CTR-M), I have no problems and can use the allowed speed of 80-90km/h. - Someone an idea what makes Timetable mode in combination with max speed different? 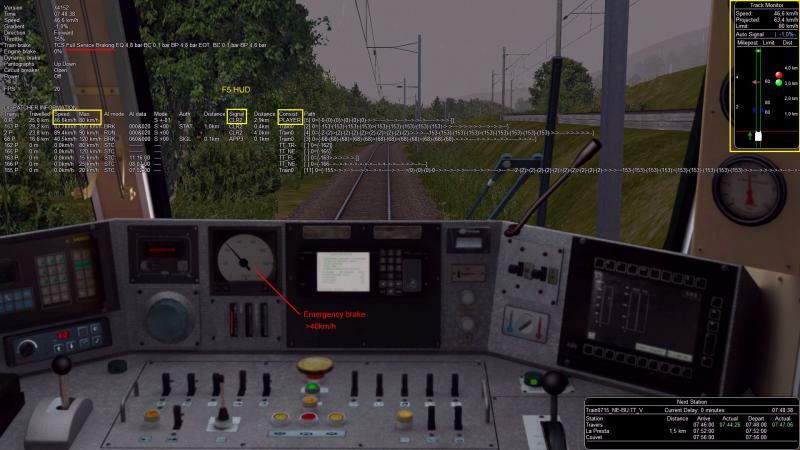 It would be interesting to know how the train performs when it runs as AI train, that can be observed using the F5 hud. Also, have you checked for any speedposts in that area using the route editor? Yes, already tried a lot. New and older OR releases tested. Multiple trains. Speedposts checked, replaced and placed extra on the route (if there is a "distance problem" or something). All changes are visible (such as extra speed indications in F4, etc.) but do not provide a solution. Another influence can of course be the signals (perhaps old speed limits, etc.). Also compared, sometimes partly replaced, but I think there is nothing wrong, and also gives no solution. Does the problem occur in or near a curve? In that case, check if you have selected the option "Curve dependent speed limit" (Main menu, Simulation tab). That could explain why it only affects the player train. Yesterday and today a lot of tested and tried. In summary, two more places discovered with such a fault, only here do only certain trains suffer? At one station these are two "long" trains, so maybe multiple signals or speedpost are activated? (further investigation). 1) that it goes wrong with "Monitor Device TriggerOnTrackOverspeed (1)". 2) In case of an error, the entire route (station to station) continues to go wrong. At previous picture the train has left the station after 2 green signals passed "free" and speedpost 80km/h (see max speed in F4). Even if you pass the next speed posts after the emergency stop (60 and 80km/h in this example) the trigger of overspeed >40km/h remains. IOW, solved after passing next station. 1) max. speed of the last signal with speed restriction (eg entry signal) is no longer updated by "signal free" or speedpost. 2) Perhaps illogical, but it seems as if speed restriction in the opposite direction / path is maintained. For the last thought I changed the opposite entry signal from "max. 40km/h" to "max. 60km/h" in the situation (as picture). OK, to be continued, for the moment it remains a mystery. I think that I put "overspeed" on all trains off. As already mentioned, a train driver must pay attention to the speeds himself. And do not forget, 95% of the rest of the route goes well. If the train was shorter than the distance between them, then you got hereafter the problem with the emergency stop. So in TSRE5 the speedpost moved up to this signal, problem solved. This shows that the speedpost has an influence on the increase of the "signal speed". When testing at other locations (such as the picture above) also such a problem. Incoming signal is at 40km/h limitation. In station speedpost is placed with 80km/h. Then exit signal (without limitation) to main track. In F4 you see "yellow-40 km/h", then "80 km/h", then "green" and the next speedposts further on. When leaving the station, F4 show "80km/h". However, the exit signal is not "updated" and It appears that "overspeed trigger" remains underwater at "40km h", which ultimately causes hereafter the "overspeed emergency stop 40km/h". It turns out that in Explorer mode or Manual mode you have no problems with "incorrect overspeed triggers". The Problem occours in TT-Mode if a signal with reduced speed is followed by a speedpost with higher speed. In activity Mode in this case the allowed speed is holded also after this speedplate on the reduced Signalspeed. In TT-Mode, the allowed Speed (F4) will raise to the speedlimit of this speedplate, what is describet so in the manual. But the Speedlimit of the overspeedmonitor is holded on the old reduced signalspeed. If I accelerate the Train after the Speedpost by some M/h the Overspeedmonitor is stopping the Train.